“It was a basic war hospital. So all we could do is stop the bleeding – and perform basic orthopaedic procedures,” said the surgeon. Dr Drobetz is Director of Orthopaedics and Trauma at Mackay Base Hospital and trained as a trauma surgeon in his birth country, Austria. He travelled to Syria in April to spend five weeks working for Medecins Sans Frontieres/Doctors Without Borders (MSF), in a derelict hospital in the north-eastern city of Hassakeh – the only free emergency care available to around one million people. “The hospital compound reminded me of the film set from Mad Max,” Dr Drobetz recalled. “It was filled with old cars and construction materials, because they were trying to rebuild the hospital as we worked. There was even an old swimming pool full of needles. Dr Drobetz and a small band of colleagues, including other international field workers and Syrian doctors, performed 10 to 12 operations per day – in two shipping containers converted into surgical theatres. The casualty list was never-ending. Apart from gunshot wounds, they treated the shattered bodies of landmine victims, who arrived at the hospital on almost a daily basis. Around half of the casualties were children. Despite limited medical resources and round-the-clock surgical demands, the commitment and team spirit of the hospital staff never wavered, according to Dr Drobetz. “Everybody wanted to work. Everybody wanted to get it done,” he said. However, lack of access to some basic equipment was a constant source of frustration. “We had one wheelchair for 25 people,” Dr Drobetz said. “And we could reconstruct someone’s leg, but then we couldn’t get them out of bed, because we had no crutches. While in Australia, we throw them away after one use. The community at the MSF-supported hospital in Hassakeh extended beyond the staff and their patients. In Syria, it is typical for relatives to take care of many non-medical patient needs, including feeding, and changing clothes and bed sheets. “So the relatives are there 24/7,” Dr Drobetz observed. “They often stay in the hospital for weeks and months, sleeping on the bare floors, supporting their loved ones. By the time Dr Drobetz left Syria, in early May, he was in no doubt about the identity of the true heroes in this country’s conflict. He himself feels “calmer”, since testing his abilities to care for countless people in over-whelming need. The surgeon also knows that if the opportunity presented itself, he would embark upon another MSF field assignment in a heartbeat. Battling to save patients with catastrophic injuries in a war-ransacked Middle Eastern hospital with scant medical resources is not on every doctor’s professional bucket list. But Dr Herwig Drobetz was hooked on the idea of helping mend broken people in broken countries from the day, as a young medical student in Vienna, Austria, he attended a lecture by Medecins Sans Frontieres (MSF). “What they had experienced fascinated me,” he said. And his professional inclinations followed suit. When he began an internship in the trauma surgery department in a hospital south of Vienna, he knew he had found his niche. “I am a specialist trauma surgeon, a six-year program which is unique to middle Europe,” he said. “We basically deal with stopping the bleeding. So we are trained in thoracic surgery, orthopaedic surgery and neurosurgery – but always in relation to trauma. A sports trauma fellowship with the Brisbane Private Hospital lured Dr Drobetz to Australia in 2004. He then took up a position as a staff orthopaedic surgeon at the Mackay Base Hospital the following year. Initially for one year, his Mackay position was repeatedly extended. “Somehow I never managed to buy a return ticket to Austria,” he laughed. Fourteen years later, he is the hospital’s Director of Orthopaedics and Trauma, and also coordinates the surgical training of James Cook University Year 6 medical students at the hospital. Daily life, including professional and family commitments, had placed his international humanitarian aspirations on hold. But not forever. In 2017, when his teenage son began to spread his wings, Dr Drobetz took the plunge and emailed Medecins Sans Frontieres. He was invited to Sydney for an interview. “They were looking for people who don’t mind being outside their comfort zone,” he recalled. “MSF need people who can work with little, improvise, and work well in a team, because you are thrown into a situation where you have to work with people you have never met before. And when you have to do complex things with little, communication is everything. Dr Drobetz passed the interview and was invited to attend a three-day MSF introductory course in Sydney, where the emphasis was on psychological and team preparation for what lay ahead. What followed was more pedestrian; finding an assignment that would fit in with the surgeon’s pre-existing work commitments. “They send you emails. Can you go to Afghanistan for six weeks, in two weeks’ time, or we have an opening in Yemen for three months. Syria was the one that fitted my timeframe perfectly,” he said. Dr Drobetz set out for Hassakeh, in north-eastern Syria, on April 1 this year. The journey took one week. He first flew to MSF International headquarters, in Geneva, Switzerland, for a project briefing before finally landing in Syria. At no stage prior to or during the journey did he lose sleep about his personal safety. Once he reached Hassakeh, he was advised never to stray beyond the walls of the large hospital compound. While the sound of gun fire was a constant backdrop to his work – and he frequently dealt with the bloody aftermath – no guns were ever turned on the hospital. 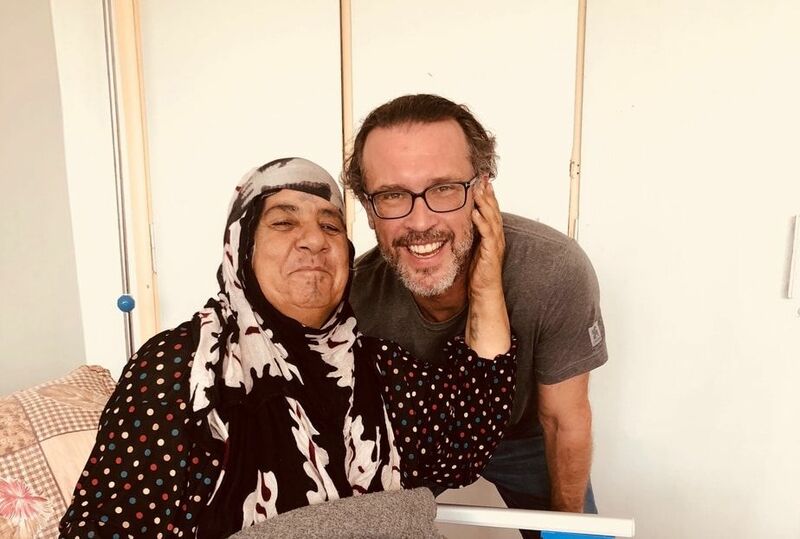 Hassakeh is no longer an active war zone, but Dr Drobetz quickly began to appreciate that the hospital’s reputation was its real shield against ongoing violence. Dr Drobetz was one of a small team of doctors from around the world, including two surgeons, two anaesthetists, an ED doctor and a gynaecologist. The foreign doctors worked closely with Syrian colleagues, including three orthopaedic surgeons, three general surgeons and an anaethetist, aided by a team of translators who took part in every operation and ward round. The Australian surgeon also had high praise for the Syrian nurses, who were mainly men, for cultural reasons. While surgeries took place around the clock, and he was regularly summoned to operate in the early hours of the morning, Dr Drobetz said he had plenty of down time. When his tour of duty concluded in mid-May, Dr Drobetz left with no mixed feelings. Médecins Sans Frontières Australia is looking for surgeons to help deliver medical assistance to the people who need it most. You must be able to commit to a minimum of three months and be a resident of Australia or New Zealand. Find out more.